By paying attention to who other animals are we learn lessons about ourselves. This past year was remarkable in terms of what we have learned about the cognitive, emotional, and moral lives of nonhuman animals (animals). A new and outstanding book called We Animals by award-winning photojournalist and activist Jo-Anne McArthur whose work also is featured in the wonderful documentary "The Ghosts in Our Machine" (see also) and a recent TED talk entitled "If We Could Talk To the Animals" by biologist Denise Herzing about the clearly smart and emotional dolphins she and her team study and her talk made me think of an incredible number of larger themes and "big" questions centering on the fascinating lives of the other animals with whom we share our magnificent planet. 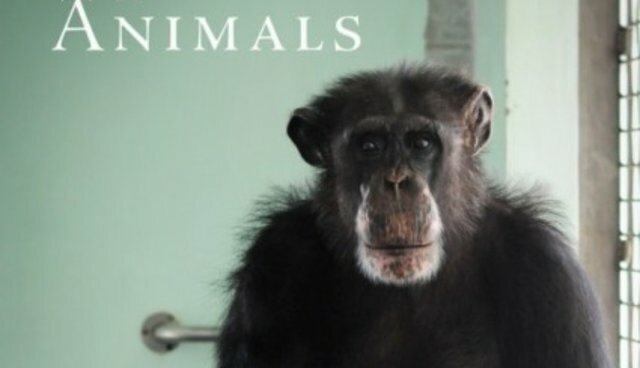 I love We Animals and hope that it receives global attention. This is what I've written about it and many others agree with my sentiments. "Internationally renowned photographer Jo-Anne McArthur, whose stunning work is highlighted in the documentary "The Ghosts in Our Machine", has done it once again. In We Animals, a riveting and timely book, Ms. McArthur invites us to reflect on the attitudes and norms of our so-called exceptional contemporary culture that range from the most reprehensible exploitation and abuse of other animals to loving them uncompromisingly with all our hearts. We Animals could well be one of the most important books in the past few years that compels us to ask who we are and who 'they' (other animals) are and to deeply reflect on how we must change our ways to make the world a safer, more peaceful and compassionate place for all beings." And, here is what Ms. McArthur had to say about her first, and let us hope not her last, book. "We Animals attempts to honour these remarkable individuals, both human and nonhuman, and to break down the mental and physical barriers we've built that allow us to treat our fellow creatures as objects and not as sentient beings ... What you see may surprise or disturb you. My aim is not to turn you away but to draw you in, bring you closer, make you a participant. I want my photographs to be beautiful and evocative as well as truthful and compelling." We Animals and "If We Could Talk To the Animals" also made me think about the rapidly growing cross-disciplinary field of anthrozoology, the study of human-animal relationships, and how much there is to learn about how we interact with other animals. There are a number of questions that frequently arise in discussions of the cognitive, emotional and moral lives of animals. For example: Are "they" (other animals) like us? Do other animals have language? Are dogs smarter than cats or vice versa? Are we smarter than other animals? Are there "higher" and "lower" animals, and do "smart" animals suffer more than less-intelligent animals? How does relativebrain size (brain size expressed as a function of body mass, called the encephalization quotient) figure into the discussions of the cognitive capacities of animals and their ability to suffer - do animals with relatively larger brains suffer more than animals with relatively smaller brains? Does it really matter if, for example, a dog or a chimpanzee behaves in the same way that young humans do? There are indeed answers to these questions and the database is rapidly growing. In some ways nonhumans are very similar to humans, and in some ways, as expected, they're different. Many researchers argue nonhumans are indeed language-bearing beings. Dogs aren't smarter than cats nor are cats smarter than dogs - animals do what they need to do to be card-carrying members of their species. While humans can do many things that other animals cannot, this does not mean we're smarter than them. Saying members of this species are smarter than members of that species is of limited use. Animals with relatively larger brains aren't smarter than animals with relatively smaller brains and they don't suffer more. I have provided more details about these and other questions in other essays. In my own research and writing, I always keep in mind Charles Darwin's ideas about evolutionary continuity - namely, that the differences among various animals are differences in degree rather than kind. Clearly, we are animals and should be proud of this fact. What continuity really means is that the differences among animals in their anatomy, physiology and cognitive and emotional lives are shades of gray, not black and white. So, the bumper sticker for continuity is, "If we have something, 'they' have it too", and as Herzing says, humans need to bridge the gap between different sensory systems. First, let's stop pretending we don't know what other animals want and need. As a biologist, I realize there aren't "higher" and "lower" animals, and labels like higher and lower really don't mean anything at all and are frequently used to justify the mistreatment of lower animals because the word lower far too easily slides into "less intelligent," "less feeling," or less valuable." So, are humans exceptional and unique? Yes, but so too are other animals. And, just like us, animals want to live in peace and safety - so let's stop pretending we don't know what they want and need. They do not want to die and surely do not want to be subjected to brutal torture before they succumb. In my latest book, "Why Dogs Hump and Bees Get Depressed: The Fascinating Science of Animal Intelligence, Emotions, Friendship, and Conservation," I review these and many other studies. It's simply amazing what we're learning about the fascinating lives of other animals. Some people call these discoveries "surprising" and exclaim, "Oh, I didn't think they could do that!" However, if people keep open minds and hearts about whom other animals are, such findings are not really surprising at all. Years ago, people thought only humans made and used tools, were conscious or self-aware, and had sophisticated ways to communicate with one another - and we now know those perspectives are wrong. People don't have to embellish other animals; we just have to let them show us who they are. There are also far fewer skeptics about the mental lives of other animals than there were even ten years ago. In July 2011, a group of renowned scientists reinvented the wheel, so to speak, and offered what's called the Cambridge Declaration on Consciousness. In that declaration, the signers concluded: "Convergent evidence indicates that non-human animals have the neuroanatomical, neurochemical, and neurophysiological substrates of conscious states along with the capacity to exhibit intentional behaviors. Consequently, the weight of evidence indicates that humans are not unique in possessing the neurological substrates that generate consciousness. Non-human animals, including all mammals and birds, and many other creatures, including octopuses, also possess these neurological substrates." These researchers also should have included fish, for whom the evidence supporting sentience and consciousness is also compelling. The question of whether other animals have language remains a hot topic, as pointed out in Herzing's presentation, and while she is still in the process of studying this (and opinions vary widely from "No way" to "Of course they do" based not on only available data but also speciesist ideology) there are some compelling data that lead to the answer "Yes, they do." Current data challenge the skeptic's view that humans are the only language using animals. When discussing language in other animals, it's essential that we consider the outstanding research on prairie dogs conducted by Con Slobodchikoff and his students at Northern Arizona University that is summarized in his recent bookChasing Dr. Dolittle. Slobodchikoff shows that humans are not the only animals who use language. In addition to charming, and highly verbal and linguistic, prairie dogs, other animals including bees, squid, birds, bats, monkeys and whales possess languages of varying complexity. Prairie dogs, for example, have different alarm calls for the various predators who try to eat them, can describe the color of clothes, and can communicate about the body style (tall, thin or short) of a human being. Slobodchikoff correctly notes that it is essential to study wild animals, no matter how difficult it might be, because "laboratory environments aren't necessarily conducive to animals expressing their full range of behaviors - when you sit in a cage all day and then are taken out for an hour by technicians wearing white smocks, you might not choose to display any behavior other than fear." Indeed, ecologically relevant and noninvasive field experiments can lead to better results that reveal much more about who the animals really are and what they are able to do when they are able to express their full behavioral repertoire. Herzing notes this in her lecture and stresses that she tries to be as minimally invasive as she can. Stepping into the worlds of other animals is always somewhat invasive, and researchers need to be sure they're not harming the other animals or changing their lives to the extent that the data that are collected are of little use. Slobodchikoff uses linguist Charles Hockett's thirteen design features of human language to prove her points and shows how nonhumans share those features with us. Slobodchikoff concludes that chapter by writing, "I show that we already have the evidence to conclude that a number of animal species have semantic signals and that these signals are arranged according to rules of syntax within different contexts." He then goes on to provide numerous examples of animal language. It's difficult to see how even the most hardened skeptics can reject his arguments. At the very least, though he really does much more, Slobodchikoff urges people to keep the door open on the nature of animal languages. Slobodchikoff recognizes that animal language is a very controversial topic and notes that the researchers he discusses might disagree with him. Nonetheless, his arguments are solid and compel scientists to conduct much needed comparative research in this area. Slobodchikoff also recognizes that "The idea that animals have language is frightening to some people, but also empowering to animals. When people find out that an animal species has a language, they often look at that species in a more compassionate way." He's right, because when people recognize the highly evolved cognitive and emotional capacities of other animals it requires us to treat them with more kindness, respect and dignity. The time has come to debunk the myth of human exceptionalism once and for all - it's a hollow, shallow and self-serving perspective on who people are. Of course we are exceptional in various ways - as are other animals. Perhaps we should replace the notion of human exceptionalism with species exceptionalism or individual exceptionalism, moves that will force us to appreciate other animals for who they are, not who or what we want them to be. Speciesist arguments that separate us from other animals, and that discount the value of individual differences even within species, are misleading and have disastrous results for all concerned. Such views are not only bad for animals in laboratories, but also for wild animals, as evidenced by the new and rapidly developing field called compassionate conservation, in which the emphasis is on the lives of individual animals. We must not ignore nature, for we do so at our own peril. By paying close attention to who other animals are and what they want and need, we can rewild our hearts and keep our hopes and dreams alive as we reconnect with other animals and nature as a whole and feel ever so comfortable with our membership in the diverse and fascinating animal kingdom. And, let's be sure that kids get out into nature so they can undo the "unwilding" that comes with much humane education, and be allowed to engage in "wild play" and be the animals who they are. Peter Gray's recently published book "Free to Learn" (Basic Books, 2013) is a wonderful place to learn about the importance of play - unleashing the instinct to play, as he puts it - for youngsters, and indeed, for all of us. We should be proud to be members of the animal kingdom. Sensationalist media that portrays other animals as brutal bloodthirsty beasts is thoroughly misleading and, in fact, we can learn many lessons about trust, friendship, cooperation, peace, and forgiveness from other animals if we pay attention to available data emerging from a wide range of studies. Researcher Elise Nowbahari in a recent essay in New Scientist called "The Gallant Ant" (a preview of the web version called "Goodwill hunting: Random acts of kindness" can be seen here) suggests that we really have underestimated the prevalence of altruism in other animals and that it is more widespread than previously thought (see also and references therein). Seeing and treating other animals for who they are doesn't lessen humans at all. We suffer the indignities to which we subject other animals. We must use what we know about other animals on their behalf, to make their lives the very best they can be and to help them to live in peace and safety. This really isn't asking too much. And, we are indeed making progress and there are many reasons to keep our hopes and dreams alive. For example, according to an update from People for the Ethical Treatment of Animals (PETA), "This year, our whistleblower footage and campaigns helped bring an end to painful intubation exercises on cats and ferrets at some of the last U.S. medical schools that still conducted them. We helped compel United and other major airlines to stop shipping primates to their deaths in laboratories, and with the help of our international affiliates, we convinced Indian officials to ban all cosmetics tests on animals in the world's second-largest country." And, New York created an animal abuser registry, the first of its kind. There are many other successes, and in the future society must concentrate on our successes as we work to make the lives of other animals the best they can be. When we accept, and become openly proud of, our membership in the animal kingdom, hope abounds because we can see that we and "they" (other animals) share a passion to live peacefully on our wondrous planet. Jo-Anne McArthur's outstanding book We Animals and Denise Herzing's TED talk are wonderful reminders of how fortunate we are to share our beautiful planet with a panoply of amazing beings of whom we should be in awe. Most nonhumans can do well without us, but we cannot and will not thrive without them. As I stroll around my mountain home I always give thanks to the animals who live there, even the ones who could kill me in an instant. The family of black bears who have lived there for years, some of whom walk across my roof and peer down at me through a skylight or poop on my front porch, and the cougars who come to my window, are all most welcomed to stay. I always love seeing a young and very handsome male bobcat come to my office door, look at me, pee, and casually walk off. When I watch two young bears frolic here and there it brings a smile to my face. If they left I'd miss them more than they'd miss me. The phrase "we animals" means all animals and we must always remember this as we move on into the future where nonhumans and humans find themselves living in peace and safety and honoring and respecting one another. There really is hope. This essay is slightly revised from an earlier essay posted here.